Having your pet spayed (ovariohysterectomy) or neutered (castrated) is an inexpensive and realistic method of pet population control. The number of unwanted adult and young animals that are euthanized each year in the United States is astounding. Aside from the pet overpopulation problem, neutering a male animal and spaying a female helps prevent, and even eliminates, many medical problems. Male cats are almost impossible to keep as pets unless they are neutered. When they reach sexual maturity (around seven to nine months of age—even earlier for some cats), their kitten lifestyle dramatically changes. A non-neutered adult male cat becomes extremely territorial. His life predominately consists of patrolling and defending his territory. Even though his immediate territory may consist of the building and grounds where he lives, he may also consider the female cat that lives two blocks away as his territory. He defends his territory against intrusion by other animals, particularly other cats. There is nothing more ferocious than a fight between two non-neutered male cats. 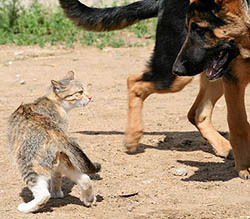 Some non-neutered male cats have even been known to attack Dobermans and German Shepherds that have entered their territory. Unless your male cat is neutered, you may be spending a good deal of time and money at the veterinary hospital, having him treated for injuries. Male cats often spray urine. This behavior is instinctive and has nothing to do with litter box training. Non-neutered males spray urine in order to identify ("mark") their territory. These unacceptable behavior traits will probably never be seen if your kitten is neutered at an early age. If your adult cat is neutered, most of these problems will disappear. A non-spayed adult female cat is a kitten machine. 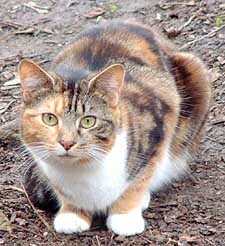 Female cats have their first estrous cycles around seven to nine months of age. During the springtime, some kittens can actually go into heat when they are five to seven months old. Detection of estrous is usually quite easy. Most owners think that there is something wrong with their cat. The cat becomes extremely affectionate, wants to be caressed, and rolls about on her back. She is very vocal and meows incessantly. No vaginal bleeding occurs (some cats may have very limited bleeding, but this is very rare) like in dogs; however, non-neutered male cats are still attracted by their scent. Your neighbors will definitely comment about the nightly musical serenade performed by the large variety of male cats that patrol your house. 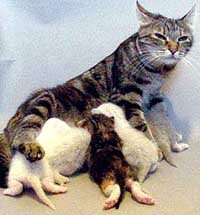 If your non-spayed female cat is bred, kittens will arrive in two months (that’s kittens, not kitten). The average litter size is six to eight kittens. More kittens will arrive again in a few more months as female cats have estrous cycles year round.